Lewis Hamilton (1st): "Firstly, I want to say big congratulations to everyone in the team - both back at the factory and here. There has been an incredible push for this kind of performance this year. We really pulled together more than I have experienced and seen over the last five years to create something quite special. I'm really proud for everyone, especially going from one era of car to another which is something that has never been done before. It shows the strength of the team and I'm proud to be part of it. The race was great, it was probably one of the most fun races that I have had for a while - and there were quite a few fun ones this year. I didn't get away to a great start, but I was kind of chilled about it, knowing from the past that I can overtake here. I had a lot of fun trying to get closer and overtaking. Today the wind changed 180 degrees and it made the track so special to drive; the car felt amazing going through the Esses. We have three more races left this season - and that's three I want to win." Valtteri Bottas (5th): "Today was a tough day for me. In the first three quarters of the race, everything was going quite well and the pace was not bad. However, I couldn't make the one-stop strategy work with all the fighting with Sebastian and Kimi in the second stint. That was wearing the Soft tyres off quite a bit, they started to go and it simply was not possible to stick to just one stop. I tried everything I could to defend, but it was too late, so unfortunately we had to pit again. I'm still disappointed with my race, and I will need a few moments to get over it. However, I'm also happy for the Constructors' title. It is amazing to be part of this championship-winning team." James Allison, Technical Director: "You can't argue with any race where you overtake on track for the lead and then romp off to the win. It was a brilliant drive by Lewis and a very welcome tonic to some of the narrative that had built in recent weeks suggesting that the momentum of the development race had shifted towards our competitors. This car, team and our drivers showed themselves today to be worthy, worthy winners of the Constructors' title. For a long time, we looked to be on course for a comfortable podium with Valtteri, too. He enjoyed a strong first stint and looked set to take second place from Sebastian for a significant portion of the race. However, in the second stint we were not able to make the tyres last well enough to help the one-stop strategy pay off. Nevertheless, he still scored the points we needed to secure the title at the first time of asking, and he will certainly enjoy even stronger races in the future." Toto Wolff: "The first words today go to our team - in the factories in Brackley and Brixworth, as well as the fantastic support we receive from Mercedes-Benz in Stuttgart. I am so proud of what has been achieved: winning across a rule change, something has never been done before in the sport, and doing it because every team member has dug deeper to find performance, been even more diligent on reliability and this has come together in the most special way. We had the quickest car out there in the race today - Lewis did a faultless job, picking off Sebastian and then managing his one-stop strategy to perfection. Valtteri had a tougher time: running in dirty air meant he couldn't convert his good pace into what would have been a deserved podium finish. But overall, we must be satisfied that we have got half of the job done today; one title down and one more still to win. Our target must to be to keep our foot on the gas and win each of the next three races." Max Verstappen (4th): "I am feeling good after the race but of course it is never nice to be about to step out onto the podium and then have it taken away. They should at least let us talk it through in the stewards' room first and voice our opinions. I had a great race and I am happy with fourth but it's the way I got there that hurts. I got a five second penalty and one penalty point for what? I ran wide on a track with no limits that everyone is running wide on all weekend, why do I get punished? The rule is we cannot protest so all we can do is move on to Mexico, weird rule. We have an amazing race with loads of overtakes and action and then due to 5cm or 10cm of kerb the result is changed, people don't like to watch that. At the end of the day I had a lot of fun and a great race. I feel I made some really good overtakes and had nice rhythm with really strong pace and balance in the car. Taking all these factors into account and no engine penalties I'll hopefully start near the front and achieve a better result in Mexico." Daniel Ricciardo (DNF, Engine): "It's obviously never nice to be out of the race early. There were a lot of elbows out and you could see a lot of contact, so I wouldn't have suspected it would be due to a mechanical issue but of course it was disappointing to finish early. I think I tried to get the most out of it today and the laps I raced were fun but also frustrating. I felt that, especially earlier on, we were quicker than Valtteri, but I always had to come from so far back that it was never going to be an easy move. I tried a lot of times to make it stick but could never quite manage it. I wasn't going to drive behind him all weekend wondering what could have been, so I don't have any regrets with the moves I tried. It's just frustrating to not continue that battle. I did enjoy it out there though. Every time I tried to overtake Valtteri he would just slip back underneath me and I thought: alright let's try again. I think we'll probably have to take a penalty which means that I will start at the back in Mexico. I'll do my best to try and charge through the field and you'll hopefully see more of today in Mexico." Christian Horner, Sporting Director: "A tremendously exciting race today particularly for Max who made incredible progress from 16th on the grid to be fighting for a podium in the last couple of laps. He made some great passing manoeuvres and on the last lap managed to make a pass on Kimi, which was then penalised with a five second penalty. This is particularly galling looking at the amount of cars that had been off track, not just in the race but all weekend without any sanction or punishment. Nonetheless a great performance and another competitive afternoon for us. Obviously we were very disappointed to lose Daniel early on in the race with an engine issue, after putting on a fighting few laps behind Valtteri. He would have been on the podium again without that issue today so we take comfort from the fact we had a competitive car and are just sorry for Max and the fans that they didn't get the podium they deserved today. Our congratulations are with Mercedes; a fourth consecutive World Championship is a tremendous achievement and they have deserved the title again this year." Sebastian Vettel (2nd): "My start was good today. I think also in Japan the start had been that good, but we just didn't have power, so it's good we had it done here. It was good to get the rhythm, but after a couple of laps I was really struggling with the tires that were getting too hot. I am a bit disappointed, because we couldn't win and I had wanted to. We are on the right track, but all the things that happened to us came out not because of bad luck or because of somebody else; I think it was all on our side and we need to admit that. Then there were races in which we were stronger and we just didn't race, which is even worse. There are positive aspects, but this was not the result we were looking for and thus, of course, it was not the best day." Kimi Raikkonen (3rd): "My car worked very well through the whole race. I was very pleased, it was so good and nice to drive. I felt we had a lot of speed and the tires lasted very well until the end. I'm sure that if we had started from the qualifying position we deserved, our pace would have been enough to get us a much better result. We kept gaining ground whenever I could push, which was a very good feeling. In the last part of the race I could have gone a lot faster, but I also had to manage fuel, so I slowed down my pace and this was a limiting factor. The final result could have been better, but we have two cars on the podium, so we cannot be too disappointed. For the next race we'll try to be even stronger. Regarding the incident involving Verstappen, I can't comment, because I haven't seen what happened from where I was." Maurizio Arrivabene, Team Principal: "Today's race was closely fought from the start to the final lap. Sebastian made a great start to go into the lead and Kimi kept the race alive, with both men pulling off several passing moves. The team, both here at the track and back in Maranello, did a good job in coming back from the difficulties encountered in free practice on Friday. The most important thing is that we never gave up and getting both cars to the podium, even if it was not the ideal result, was achieved by fighting right to the end. We did that thanks to a car that, yet again proved to be competitive. Just as we did today, we will continue to fight to the very last corner of the final race." Esteban Ocon (6th): "Sixth place feels very satisfying because it was not an easy race with so much pressure from Sainz in the final stages. I spent a big part of the race just managing my pace and looking after the tyres to make the one-stop strategy work. The team told me when to push and when to manage the pace, and to finish sixth shows we judged this almost perfectly. Before the race there was an issue on the grid with a control unit in my car, but the team did a really good job to make the repairs in time for the start. The car was strong today with good pace and it's another race where we have come away feeling we achieved the maximum result that was possible." Sergio Perez (8th): "It was a difficult race and I am very happy we managed to score some points. We tried a very aggressive strategy to make up ground after yesterday's qualifying session and we made a very early stop to undercut Massa and Sainz. We managed to do so and I passed Alonso on track, and then got close to Esteban. At the time, I thought I had much better pace because he was saving his tyres, but being in traffic really damaged my tyres and I fell back. It's hard to know how things would have gone if I had got past Esteban - maybe I could have saved my tyres a bit better. When Sainz was behind me, I couldn't do anything because his tyres were much fresher. Towards the end, I had a hard time defending from Kvyat and Massa, and I really struggled to keep Felipe behind in the last few laps. My tyres were on the limit, but I am happy I was able to finish eighth. It's been a good result for the team so we can be happy." Robert Fernley, Deputy Team Principal: "It's been another competitive weekend with both cars showing strong pace and racing well this afternoon. The one-stop strategies for both cars paid off and we've scored 12 points to consolidate our fourth place in the championship. Managing the pace and looking after the tyres was critical today and both drivers did what was asked of them. They attacked in the early stages and defended well after their stops. Esteban's battle with Sainz was very intense and it was fabulous to see Esteban hold him off - especially considering Esteban's has not been well this weekend.a Similarly, Sergio's defence against Massa in the final few laps demonstrated Sergio's fantastic race craft. Today's result is the ideal way to prepare for next week's Mexican race, which is a hugely important event for everybody in the team." Felipe Massa (9th): "It was definitely a good result. It was a good race, and points were always what we were looking to achieve. We lost a few points to Renault, but it was a positive race and I'm happy with the result. Unfortunately, the blue flag took away my opportunity to overtake another car at the end and take eighth instead of ninth, but I'm happy with the race and the job I did. That's the most important thing." 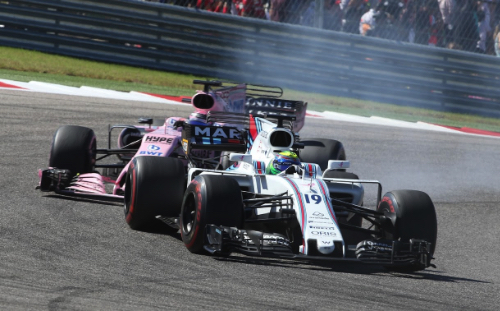 Lance Stroll (11th): "It was okay and a decent race from where we were starting on the grid in 15th, but it is always disappointing to finish 11th with no points. There were a lot of tyre problems and I had to stop twice as I had a lot of degradation, which was a lot more than expected and not ideal. We did gain some positions, unfortunately not enough to get us into the points, but passing the two cars of Grosjean and Vandoorne at the end of the race was quite positive. Now I am looking forward and hoping for a trouble-free weekend as this one proved tricky after what happened in qualifying." Paddy Lowe, Chief Technical Officer: "I think it was a great race for everyone concerned and especially for the fans. It's a fantastic event that's been put on today which included some new initiatives. Ultimately, we're happy to get ninth and 11th but it's a bit frustrating as I know we could have done better. We ran a contrary strategy to most of the other runners with both cars fitting supersoft tyres to start, with a plan to move on to the ultrasoft tyres for the final stint. In Felipe's case, that worked okay and he drove to plan, making up places in the first stint on the faster tyre. Ultimately, we would have made more places but the DRS of Kvyat and Perez in combination caused too much of a delay. On Lance's side, he had two tough first stints but when we converted to a two-stop, he made up good places at the end to finish a very worthy 11th." Stoffel Vandoorne (12th): "Today was actually a pretty exciting race for me! Even though it wasn't for any points, I think I put in a very good performance after a difficult qualifying starting from the back. We made a lot of overtakes on merit in the corners, which maybe weren't really expected considering the lack of straight line speed we have. We had a good strategy and some good fights on track, so I'm happy with my pace and I think we maximised our potential today. It was a shame to get so close to the points, but we were always going to struggle starting so far back today with the penalty. It's always satisfying when you can overtake on track and we were reasonably competitive, which is encouraging, but we'll have to wait and see for the next few races. We know that some tracks suit us a bit better than others and this one should have been one where we scored points. We can't guarantee that we won't have to take more penalties in Mexico, but we'll wait and see and hopefully can make the most of every chance we get." Fernando Alonso (DNF, Engine): "Today I think we really deserved to collect some points. We did a good qualifying, a good race, and made a good start, but with no reward. From our side I think it was an amazing performance. On the straight I lost power - I felt some vibrations in the engine and some really weird things were going on. It's such a pity. In the last few races we have lost so many points - possibly 15 or 20 - which probably could have helped our position in the championship for myself and also the team. It's painful, especially because today we were seventh on merit and we had fought for that. There are only three races remaining and we really want to do well, because the boys in the garage work really hard day and night to prepare the cars properly. Even this morning they had to change Stoffel's engine and both crews were working together on that, then they prepared for the race and performed some perfect pitstops. Today really was a missed opportunity." Eric Boullier, Racing Director: "Today was another race where we witnessed the talent of both our drivers but came home bitterly disappointed and with little to show for it. Fernando started brilliantly and was maintaining pace with the pack around him through the first stint and initial round of pit stops. He had the capability to secure seventh or even sixth place and score valuable points for the team, but was denied due to an MGU-H issue which has compounded the problems we've faced all weekend, albeit on the other car. It would seem that despite huge potential, luck hasn't been on Fernando's side in the USA this year, which has been heart-breaking for all of us. Stoffel was the unfortunate recipient of 25 further grid drops to add to his existing five-place penalty, owing to an MGU-H problem found this morning which required a full PU change in order to get him out on track in time for the race. This dropped him to the back of the grid at the start, rendering any hopes of points almost impossible. Still, Stoffel drove impressively well here - his first time racing at COTA - with no less than four bold overtaking manoeuvres that went unseen on our TV screens. It's a huge shame that these issues robbed us of a strong result at one of the few tracks left this season where we were hopeful of a more positive outcome. The problem encountered on Fernando's car means that Mexico will be another tough race for us, but we'll keep on fighting." Yusuke Hasegawa, Honda: "Today was an incredibly frustrating day for everybody in the team. We came to the United States Grand Prix with high hopes of being able to score some much-needed points, and unfortunately reliability issues across both cars cost us a top-ten finish. This morning we detected an issue with Stoffel's MGU-H and made the decision to switch his power unit. This meant he started the race from the back of grid, giving him a tough task for the afternoon. Despite this, Stoffel drove an excellent race today. He overtook cars on track and maintained a good pace throughout. It was unfortunate he couldn't quite score a point to reward his efforts. Fernando started today from eighth on the grid and was up into seventh at the start. He maintained his position and kept his rivals behind him, until his race came to a premature end because of an MGU-H issue. It's very disappointing that we faced more issues with our PU - particularly because the reliability has been relatively stable in recent races. We will immediately investigate the issue with the Sakura team and work towards a countermeasure for Mexico next weekend." Daniil Kvyat (10th): "My best race of the season for sure! I'm very happy about the result and I did everything I could to bring the points home. I really enjoyed myself, it was a very clean and enjoyable race and overall a good job by the team. We kept it together with limited running and we still managed to get into the points. It's a pity I couldn't defend from Massa, but I had less grip with my soft tyre and we had some energy deployment issues so my straight-line speed was down. I came here with a fresh mindset, we shuffled some things in the team to give everyone some new motivation and some new focuses. Everything has been working fantastically this weekend and the race was just great." Brendon Hartley (13th): "It was tough out there, but it's been an awesome debut Grand Prix! It's all starting to sink in now and it won't be until I go to bed tonight and put my eyes at rest that I'll start to process everything... I didn't do the best of standing starts, but it's been a long time since I did one of those! After that, I was in many battles and I'm satisfied with my race - the pace was pretty strong, especially at the end. I think the only small mistake I made was getting overtaken by Stroll a quarter into the race, as I couldn't pass him back and he held me up a bit. So there's been lots of challenges, lots of things to learn and I hope I get another shot at it to put all these experiences into practice! I've enjoyed every single moment of this race weekend and I'd like to thank the whole team for this, it's been amazing!" Jody Egginton, Head of Vehicle Performance: "Today's race was one of mixed emotions: on the positive side, we have scored a point with Daniil and Brendon has had a solid debut Grand Prix. On the flip side, unfortunately both Williams and Renault have taken points off us in the Constructors Championship. In terms of the race itself, the strategies for both cars panned out pretty much as predicted. We expected some traffic for Brendon and, as such, we were ready to move stop laps to get him into free air if possible. However, after doing this to avoid a time loss with Ericsson, we were a little bit more restricted in what we could do to jump Stroll, so we were not able to do so. Once this said, Brendon should be pleased with his race, as he has performed consistently and delivered on everything we asked of him and for sure he picked up further useful experience and understanding of our car... well done to him! Daniil's race was spent in a close battle with Massa, Sainz and both Force Indias. He was running 9th until the last laps, when Massa, on fresher tyres, closed the gap. He then pushed his PU once in the DRS zone and made the pass, which unfortunately we were not able to react to due, in part, to a potential battery issue, which meant we were limited with energy deployment. The midfield fight remains tight. It's all still to play for and we will continue to do all we can to take the fight to the other midfield teams in the remaining races in order to fulfil our season targets." Romain Grosjean (14th): "Not much pace in the car, and massive tire degradation on my front-left tire. I was trying to hang in there, but the last few laps I felt it was pretty dangerous. Off track the weekend's been great with the fans. I'm very sorry we couldn't put on a better show from the team. We're all going to work hard. We know Mexico was tough on us last year but, hopefully, we find some solutions. We're going to work hard, but right now it's disappointing not to put on a better show at home." Kevin Magnussen (16th): "Not the best day for us, but the car was actually better from qualifying. We just had to pit at the first lap, so our tires - we tried to do the whole race on softs, but not quite possible. We had to try. It was the only thing we could try in that situation. So, onto the next one." Guenther Steiner, Team Principal: "Obviously, a tough weekend for the whole team. We were just not fast enough. We had every issue you can have. I think it went over the whole weekend, but today we had hoped to get something back and we didn't. We regroup, try to get better and get back to where we were a few races ago." Carlos Sainz (7th): "It was a great debut for me with Renault and I really enjoyed myself out there. Right from the beginning, every lap I was feeling more confident with the car, so I was able to push harder. I was able to attack the Force Indias, which have been out of reach for the team for the past few races, so to overtake one and attack another was a great result. Everything has gone very smoothly the whole weekend; I knew I could be quick and I had confidence in myself. The whole team has really helped me out and that was key to adapt quickly. To have such a good qualifying and race makes me really happy and I have great thanks for every single member of the team." Nico Hulkenberg (DNF, Oil pressure): "It's too bad things happened the way they did, I really enjoy it here but unfortunately my record hasn't been great. We had a problem with the oil pressure, it dropped so that forced us to retire and stop the race. Sometimes it just goes against you and that's the way it is. We'll turn it around next week in Mexico." Cyril Abiteboul, Managing Director: "It was a mixed weekend for the team. On one hand, Carlos made a fanfare debut with an error-free weekend. He arrived extremely motivated and well prepared in a team that was equally ready. We've done a remarkable job together since the announcement of his arrival at the Japanese Grand Prix. He drove an aggressive but intelligent race. Despite losing a few positions at the start, he was able to bounce back with brilliant driving skills. On the other hand, reliability cost us dearly again with the penalties and retirement of Nico's car due to an engine issue that is still under investigation. At first glance, his engine isn't damaged. Nico would have been able to get the car into the points. We apologize to Nico, who is just as frustrated as we are. This weekend demonstrates we have everything we need to fight for points and to climb back in the Constructors' Championship." Marcus Ericsson (15th): "It was a good weekend for us. We could fight with our direct competitors throughout most of the race, and were able to keep up a good pace. Unfortunately, it became difficult to keep that up after having a collision towards the end of the race. Overall, the weekend was positive, and the race was one of my best this year. That's definitely a good step forward, and we have to continue making progress to return stronger in Mexico." Pascal Wehrlein (DNF, Damage): "It was a short race for me today. I had to retire after my car was damaged in a collision that took place during the first lap. That was very unfortunate and did not give me a chance to earn a good result. On a positive note, we will be back in our cars in Mexico in just a few days. I hope to have a better race there." Frederic Vasseur, Team Principal: "In comparison to other race weekends, it is positive that we were closer to the competition today. Marcus put in a good performance with a decent pace. It was unfortunate for Pascal that he had to retire the car because of the damaged floor. The next race weekend is just around the corner, as we will be back on track at the Mexican Grand Prix."